Interventions come in the form of an irritating other. It’s not that people are irritating in and of themselves. Well, to be honest, some are. They’re irritating when they call us to surrender. Even when they don’t realize it. You either surrender or cuddle up with your lesser self. In my life, tumultuous frustration precedes surrender. It’s the kind of frustration that’s really about one thing but touches everything. Recently I was approached by – an irritating other – a book agent. 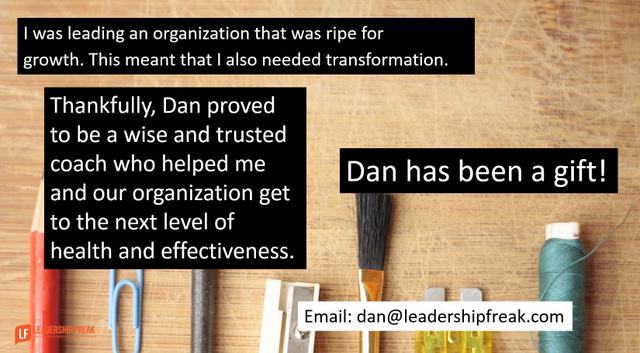 He’s worked with some top leadership authors in the U.S. Anyone who desired to write a book would be thrilled. I’m angry. I’m not mad at the agent. I’m mad at everything. I’ve been at the point of surrender before. ‘Yes’ scares the crap out of me. Surrender is the battle between fear and desire. The frustration of wanting something different – while resisting change – always builds to the point of surrender. #1. Name your dangerous desire. I’m talking about playing it dangerous. I’m talking about desires that terrify us because it feels like our personal worth is at stake. The answer isn’t that you want to serve others. That’s part of it. The answer is that you want to feel like you matter. #3. Embrace awkward-feeling behaviors. What will you try? #4. Get specific. When/where/how will you try? Perhaps you’ll sit at your desk from 7 a.m. to 7:15 a.m. typing what comes to mind. #5. Adapt as you go. When and how will you evaluate progress, method, and strategy? #6. Expand the team – don’t shrink the dream. Who might help? It feels easier to not try, when outcomes matter deeply, than to try and fail. How might leaders bring people to and through surrender? Quite timely for what I’m experiencing. Thanks Stephanie. You have you my best for your journey. I had to read this twice to really get it (or at least think that I get it. lol). I find I tread close to surrendering, then due to fear or not wanting to disrupt my current comfort, I go cuddle up with my lesser self. As a person thinking about my own choices of not surrendering, it appears that I will always find something to delay the surrender. Nothing yet to make the commitment to never chase that idea again. It never goes that far. Just far enough to delay the actions (or even small steps) I could be taking right now. There is always something else that steps in as a “higher priority” (which I admit, I’m in control of what my priorities are). Be it, “I should work out to be more healthy/lose weight”, “spend more time with my family”, or “I should spend time doing the hobbies I like doing”. Lack of defining what I really want? perhaps. Thank you for sparking the fire of self-reflection. To your favor request: It doesn’t matter to me if you choose to write a book or not. If you choose to stop writing your blog, I will miss it. Thanks for doing what you enjoy, as I enjoy what comes from you doing it! Thanks Nick. Your transparency is refreshing to me. I find that “not now” or “not yet” are perfect defenses against surrender. In addition, finding a small fault with an otherwise great option allows me to rule the whole thing out. Perhaps no purpose has struck a chord with me more than the statement “The answer isn’t that you want to serve others. That’s part of it. The answer is that you want to feel like you matter.” Somehow this statement summarizes my central theme so perfectly. Thanks for this article. Thanks George. I find it’s safe to say I want to serve others. It’s also true. But, I hide behind the desire to serve others. In truth, I’m seeing that I hide behind lots of things so that I don’t have to face deeper reality. Thanks for your comment. It encourages me. Doesn’t this also align to your recent blog on excuses. Partially true – I like to serve others – while masking the excuse. 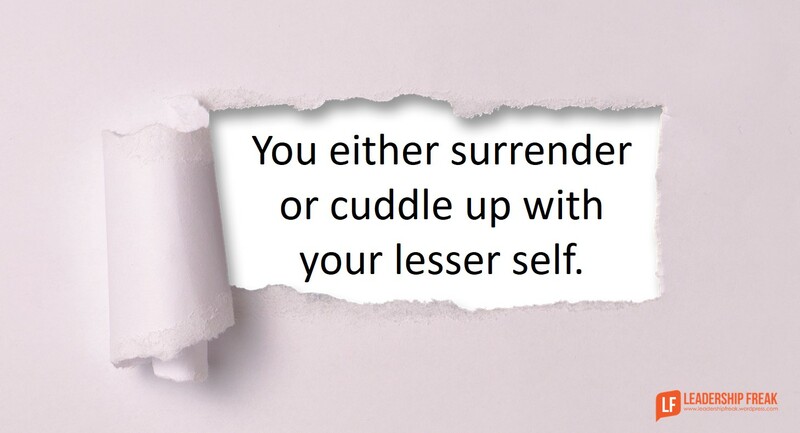 You either surrender or cuddle up with your lesser self. …when i “finally” decide to surrender, when I become “fearless”, it feels so right. Let go, and let fear, it’s not that painful. Great thought provoking post Dan. Have a good day! Love your posts and share them with my 20-something kids! Thanks Reeblind. I wish I would have listened better when I was 20 something. I believe we all wish we would have listened better in our early years, nice to know we worked out our imperfections to some extent. At least we think we did! I have found that indecision is the worst! Once you clarify and define and decide…and jump in, it is so much more a better feeling than previously. If you are someone who has been around young children, you have probably seen that before each milestone is a period of fussiness and acting out; then suddenly the child is rolling over, or crawling or walking. The fussiness and frustration is a time to get it all sorted out before getting on with it–we “grown-ups” are no different! Thanks Margaret. Your illustration is awesome. You gently put us in the same bucket as young children. Love it. A version of surrender From the Thesaurus to be brought from one point to another. Such as a postman surrenders a package. The package is delivered, given to another person place. I like to apply it to beliefs and thoughts. Surrender is the root from where change can begin. I find surrender happens at many different levels. Before I decide holding onto my old idea or belief has caused me enough frustration, pain and whatever else comes along with my resistance to change. The level of my pain is always equal or greater than my resistance to surrender. Love your post thanks for so many ways to think differently. Thanks for a useful illustration. “The answer isn’t that you want to serve others. That’s part of it. The answer is that you want to feel like you matter.” Great statement. I want to feel like I matter, like I am a contributing team member and that my thoughts and feeling are part of the pie. If you leave everyday after work feeling like I matter in this company then you will keep coming back everyday and put in 100% effort. While reading and thinking about this post I felt pain of that anxious excitement between fear and desire, while thinking about my own present circumstances and opportunities. Good stuff. Thanks John. “Anxious excitement,” is a great expression. You remind me that the way we interpret emotion is an important aspect of our mental state. Before giving a presentation you might call your emotions fear. Or, on the other hand, you might call them excitement. My reading indicates that this is more than psycho-babble. Personal transition involves three stages: letting go of what was, sitting in a neutral zone, and embracing what is. Every phase involves some degree of angst, but especially the neutral zone. It’s cloudy, murky, uncertain, and scary. So we sometimes try and migrate back to what once was. But that door is closing. Or closed. And we end up back in that dreaded place. But the neutral zone is also enlightening, exciting, hopeful, and optimistic. As long as we turn towards what is. Our best work comes from the neutral zone as it forces us to be creative, innovative, and daring. I’m in a neutral zone professionally. Lots of org change. It can be frustrating waiting for “what is” to appear. Until I realize I’m in charge of what is; not the org. I’m moving towards my destiny; not theirs. I’m moving towards what I want for myself; not what they think I want. Dan. You. Matter. YOU. MATTER. So spend a little more time in that neutral zone until you figure out what you want to move towards. And then move towards it with the same gusto, insight, bravery, and passion you’d advise us to. You. Matter. Not to us. But to you. None of us will ever regret the path you didn’t choose to take. Only you might. So take it. Because you matter. Thanks Alf. It’s great seeing you here today. I hope your studies are going well. I didn’t realize that your were in the “neutral zone.” I think one important function of leadership is providing as much clarity, focus, and direction as possible. You personal message is well taken by me. When we put too much weight on the opinion of others we make off balanced decisions. When we hold back, others won’t regret our missed opportunities. Brilliant. Going for the job that I have now was surrendering. I had been volunteering for the organization and my desire was to work for it. I was scared. Applied and went for different positions until I got the one that was meant for me. I am happier for it.